Cambridge residents gathered in the Smith Campus Center Thursday to view preliminary sketches of a redesigned Harvard Square Kiosk. The kiosk has housed a newsstand since 1984. Amidst the hustle and bustle of Harvard Square’s daily life, ongoing plans for a complete transformation of the central Harvard Square Kiosk and its surrounding plaza are underway. 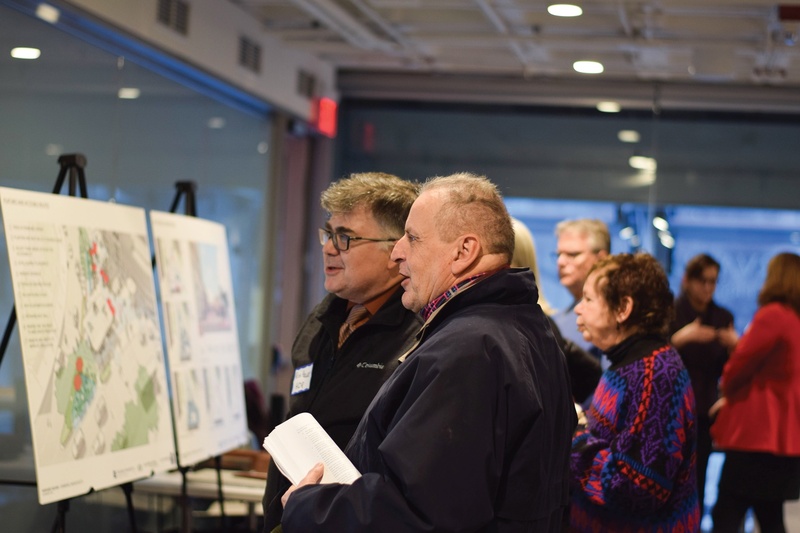 Designers, architects, and citizens mingled at a public showcase Thursday to view and discuss the project’s progress. More than three years ago, the City of Cambridge, which owns the property, first launched an initiative to restore and rejuvenate the space. The kiosk is currently occupied by Out of Town News, which offers the Square’s visitors a selection of newspapers, magazines, and souvenirs. The plan's central priorities are to achieve greater accessibility, incorporate innovative technology, improve ease of transportation, and provide social services to marginalized populations. Proposed programming in the space includes festivals, music performances, art installations, historical exhibits, and food donation drives. The design incorporates a high degree of flexibility, while also preserving historical significance, said project architect Theodore T. Touloukian. He described the new space as “adaptable,” while also also respecting the original structure. Katherine F. Watkins, the Cambridge City Engineer, discussed the importance of the space’s sustainability. "In terms of design, it’s really how will this space work for people today, five years from now, ten years from now, twenty years from now, and really making sure it’s a timeless piece,” she said. Though designers and organizers were optimistic, several residents in attendance voiced their concerns about the design plans. Vincent L. Dixon, a former Harvard Square tour guide, said he is worried about the possible lack of tourist information and welcoming aspects of the kiosk during renovations. “They will pretend to provide some services on a very limited basis and people won’t even know to come in,” Dixon said. Organizers purposefully hosted the public showcase with the goal of soliciting public feedback, according to Touloukian. In the wake of several Harvard Square businesses closing, Vice Mayor Jan Devereux said the success of the Harvard Square Kiosk is vital for the area. Though Out of Town News’s lease ended today, Devereux said the City Manager renewed the lease so that the space remains occupied during this planning period. “We have enough vacant spaces in Harvard already – we don’t need another one,” she said. “I’m very interested because I care about the space. It’s the heart of Cambridge and it is a landmark. It is a point of reference, it is a focal point of the community and has the potential to be even more so,” he said. Renovation plans indicate construction on the redesigned kiosk space will begin in summer 2019.